The two most used Kajals in India are Maybelline Colossal Kajal and Lakme Kajal if I take drugstore barnds into consideration. I believe there is not one woman in the country that has not used the Lakme Kajal at least once and since the Colossal Kajal is so hyped and raved about, I think it is the same with Maybelline Colossal kajal as well! I personally consider the Lakme Kajal to be the best budget kajal and that is a completely personal choice. 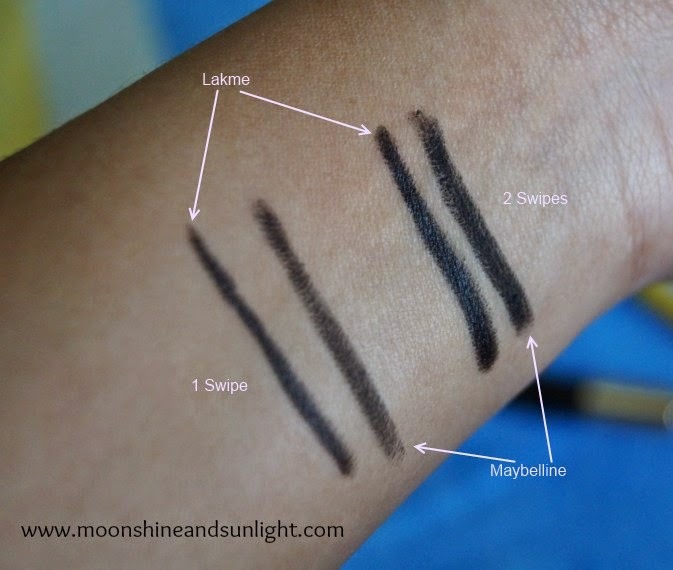 I am testing two of these most used kajal from Maybelline and Lakme on a few grounds and let us see how these perform. Maybelline Colossal Kajal (MCK):- Stays for 4-5 hours on the waterline and stays on the eyelids for almost the whole day without smudging. Lakme Kajal (LK):- Stays for 3-4 hours on the waterline and stays on the eyelids for the whole day but gets smudged. MCK:- Is less pigmented than the Lakme Kajal and has no shine or glossiness. LK: - A very dark glossy black finish. LK:- Smudges a lot when rubbed. MCK:- Dry and rough texture. LK:- Soft and creamy texture. MCK:- Not very easy to apply. LK:- Extremely easy to apply. Practically glides on my waterline. MCK:- Needs to be removed with a makeup remover. LK:- Needs to be removed with a makeup remover. MCK:- Burns my eyes when applied on water line. LK:- Doesn’t burn my eyes when on waterline. MCK:- The bullet of kajal breaks sometimes and gets messy. LK:- Pencil has to be sharpened but the wastage is okay given the quantity. ***I skipped out on testing how water proof these two are but if you would like to know that let me know in the comments and I will update that as well. So, I like Lakme Kajal for my everyday use, especially when I am in a hurry and Maybelline when I know I am going to be out for a long time and need the kajal to last a long time. Which one would you pick for your everyday use? ?